Sony HDR-CX500 is recognized due to its attractive points, like latest Exmor Rtechnology, stabilization and its design. With seeking higher quality of digital life, people prefer to enjoy camcorder video recordings via LCD projectors. Some video editing is needed to perfect video files before playing. As we all know, most of editing software can not support AVCHD video files perfectly. Therefore, there is a need to do some conversion before editing and playing. By google, you will find Aunsoft MTS Converter for Mac is the recommended program for making dealing with Sony AVCHD footage. It is good at converting AVCHD video files to other editable formats as well as deinterlacing 1080i interlacing video files. 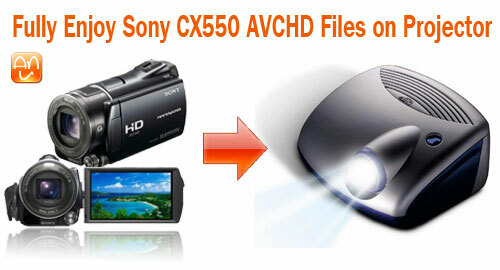 Now share you the guide of converting CX550 AVCHD to MOV for FCP and then play it on LCD Projector. Step 1. Load Sony CX550 to this program. After transferring MTS footage to Apple hard drive, drag and drop files to this software directly. Or click "Add" button to realize this importing. Batch video files are allowed to load, so joining several video files into one can be accomplished by ticking the checkbox of "Merge into one file". Step 2. 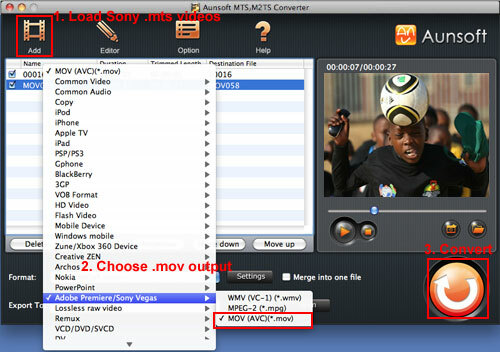 Choose H.264 MOV as the output format. Click "Format" and follow Adobe Premiere/Sony Vegas->MOV (AVC) (*.mov), MOV has been selected as ouput format. Step 3. Edit and deinterlace 1080i MTS video files. Click "Editor" button and the editor interface will come out with several editing options. You are allowed to split video files, add image or video or replace original audio with your preferred one. When you goes into "Effect" section, the checkbox of "Deinterlacing" lies there. Tick this box, interlacing files can be removed perfectly. Step 4. Start this 1080i to MOV for FCP conversion. Click the "Convert" button, this Mac Sony AVCHD to FCP Converter will begin the conversion from CX550 MTS files to H.264 MOV rapidly. Now connect your projectors with iMac, and you can enjoy these perfect video recordings on LCD projectors.